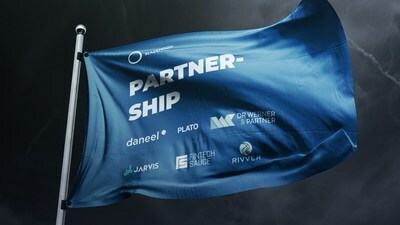 VALLETTA, Malta, April 2, 2019 /PRNewswire/ -- Blackmoon Financial Group, a blockchain Financial Service and Fintech firm announces multiple partnerships with reputable firms which include of Daneel.io, Plato Technologies Inc., Dr. Werner & Partner, Jarvis International Ltd., Rivver and FintechSauce. The strategic partnerships serve to assist in the creation of branded Exchange Traded Indexes (ETx). The new partnerships between Blackmoon and these firms will enable them to work very closely together to create a showcase of investable ETx's that track the performance of a multitude of products, services and sentiment indexes that these firms offer. Firms partnering with Blackmoon have an advantage over their competitors as they are able to further monetize their offering by making it an investable product. For example, the partnership with Daneel allows the firm to turn their already successful sentiment API into a feed for an investible ETx, therefore, allowing investors to invest in the hype (or lack thereof) of a particular set of cryptocurrencies. "As soon as we met in Malta Blockchain Summit, we were directly aligned with market expectations and the collaboration was the logical next step, we are eager to see how investors will react to this new kind of indices made possible by the AI," said Harold Kinet, Head of Communication at Daneel. Fintechsauce will roll out a few ETx's with Blackmoon whose goal will be to create investable ETx's that track FintechSauce's investable products. On the other hand, the ETx developed with Rivver will track their issued digital assets in real time. Jarvis Exchange's ETx tracks the performance of a variety coin sets such as "most-traded" and "most-volatile" on the Jarvis Exchange. Furthermore, Plato's "On-the-fly" ETx's aim to provide investors with direct access to Plato's real-time strategies. Dr. Werner & Partner's ETx, on the other hand, will give investors direct access to Dr Werner & Partner' client base. Blackmoon is still working on more partnerships and will announce them as they happen. Knowing that one can liquidate his or her investment without an impact on price, is a key risk-metric to any and all investment decisions. An STO that supports a thriving and liquid market, immediately increases its perceived value, even if its product, bottom-line or management is not as high a quality as its competitors. The liquidity of the marketplace defines the risk for an investor and the success of the issuer. Without the ease of execution and liquidity, any STO will have limited success, if any at all. Blockchain technology may be a better alternative to raise capital from investors. However, price discovery and trading liquidity also require the inclusion of speculators. The ETx that Blackmoon issues on behalf of its partners' brands incentivise traders and speculators to take the risk in the market, by offering them a fungible financial product to arbitrage for profit - further adding bids and offers to an STO that would otherwise not exist - effectively creating a balanced and stable price. The strategic partnership with Daneel is one of many that Blackmoon intends to form over the coming months. Their ultimate goal will be to have an entire suite of innovative ETx's to offer their own clients as well as those of their partners.